This Platinum Ambulance was known as the Most expensive ambulance service in the world today, You can enjoy the luxury of this stretch limo ambulance by Mark C Miller for about $350 per hours!! It's really reasonable for the premium ambulance services. Let's take a look inside this Platinum ambulance service which is claimed as the most luxurious ambulance vehicle on the world today. A first glance outside this stretch limo ambulance didn’t give us an impression of being a vehicle which might be used for such a grim scenario, but surprises do come along. Meant for the higher consumer bracket, the interiors cater to this niche segment in every inch of the way. 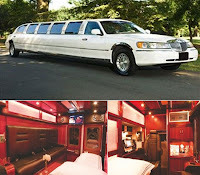 Hand-crafted mahogany wood detailing, with Wi-Fi internet and satellite television, along with amenities for a bar, Jacuzzi, library, fully fledged entertainment system and computer, chef, personal attendant and masseur at personal convenience, are just some of the luxuries associated with the services from Platinum ambulance. The ultra smooth ride on this vehicle is courtesy the extra-wide tires and specially designed chassis, which will give you an experience similar to that of floating on pillows! it seems that this Premium Ambulance Services doesn’t really have much competition in this segment, does it? Looking at the current scenario of high-income individuals, the CEO of Citywide Mobile Response Group, Mr. Henry Alpert feels that there will be quite a few takers, especially near the area of New York. Hence, 600 of these limo-ambulances are being prepared of this elite segment of consumers. The question is do you really need a premium ambulance services to take you to the hospital? most of the people need to rush to go to the hospital and didn't really care for that.. How about you? will you just try this Platinum Ambulance the Most Luxurious Ambulance Services? and waste your money on this nonsense premium ambulance service?